This day is similar to mother's day in the West, except that all women are celebrated. 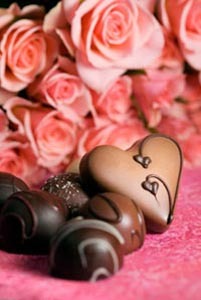 For Russian women this day is very important, more important than Valentine’s Day is for us in the West. Be prepared with flowers, a box of chocolates, a card, etc. for the important women in your life. Historically, March 8 has long been internationally associated with women's rights, beginning with a famous mass protest in New York on the 8th March 1857, when women from sewing and shoe factories demonstrated for rights equal to those of men. Men had recently won a 10-hour workday. Women, however, were forgotten in the legislation and kept to a 16-hour workday. The strike was well-publicised and gained public support and became a day for regular demonstrations in the US and Europe. In 1910, during a meeting of women in the Socialist International, a proposal was made to adopt March 8th as an international socialist holiday marking the struggle for women's rights. The International did adopt the idea, proclaiming just such a holiday, but did not assign to it any particular date, leaving that decision up to the party members from each country. 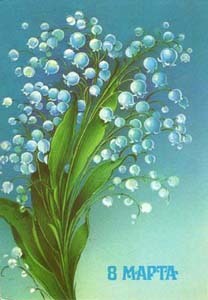 This 1932 Soviet poster is dedicated to the 8th of March holiday. 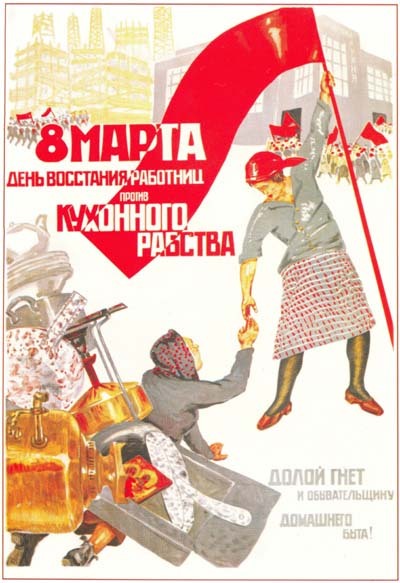 The text reads: "8th of March is the day of the rebellion of the working women against the kitchen slavery" and "Down with the oppression and narrow-mindedness of the household work!". Originally in the USSR the holiday had a clear political character, emphasizing the role of the Soviet state in liberation of women from the second-class citizens' position. The day was first celebrated in St. Petersburg in 1913, but it would not become an official state holiday and day off, until 1965. Most likely, however, the greatest historical significance of the date for Russians is as the date that Russian women first gained the right to vote: on the 8th March 1917 (according to the Julian calendar), under the newly installed Provisional Government. Russian women had campaigned for more rights as the war effort, during WWI, had necessitated that they take on a greater role in the workforce and society. As an interesting note to end on, American women would gain the right to vote only three years later. with an emphasis on their beauty and motherhood. 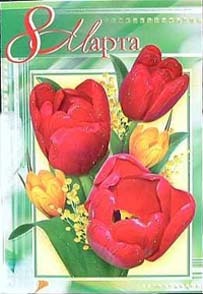 Most late Soviet 8th of March postcards carried no political meaning. 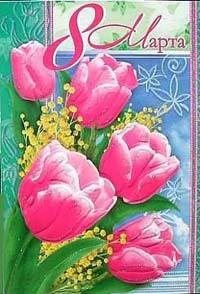 to all Russian women in our lives! Oh my god. This year I don the unthinkable! Just remember when you buy her flowers the number must be always odd ..... and normally 11 roses, carnations etc means you love her very much and don't forget the chocolates! I am sure that she will also like to have flowers on Valentines day and a dinner too! I don't know a woman who doesn't like receiving flowers. Be prepared for this day! Do it right! or be warned! If you had read this board..... you would know not to mess her best day the 8th of March! 11 is not the right number. When you do above 9 flowers (stems) you need to get the numbers right. If you don't believe me then ask Mrs wiz. OK I will concede that you got the rest right, chocolates, Valentines day and a nice dinner on both days. I did asked Mrs wiz and she said she doesn't know and she didn't mind when I give her 11 red Roses. Al she cares is not to forget the day! You obviously have been scammed........ after you were told off not to smoke! Any how my information came from a Russia Lady in Moscow and I don't think she wanted to make look cheapskate! But I must admit .... that I can't afford millions of roses to show her my love like the painter Pirossmani! To be honest I never thought about the number of flowers and the meaning of it. But I have search and what I found it is very interesting and of course I will share it with you. Fifteen and over = Now all things are possible. Thirteen = Are not acceptable to give, unlucky number. Wiz always bought for me 11 read roses ...... Now I know the meaning of it. For me personaly more important it's the intention from my other half, but not the numbers. 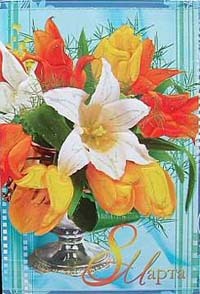 I am glad that you did some research about the numerical codes of flowers. I fully agree with you when you say that the number of flowers is not really important and that what is important is the intention behind the flowers. The codes that I was told are slightly different, I was given the secret codes by a Russian friend (a guy). The reason that I added Russia to the list is because as we all know things in Russia are always a little different depending on who you are talking to and who is talking to you. I will though disagree with you about the single flower and that is because the single flower depends very, very much on the circumstances in which it is given. As an example a few months ago Alla was sitting in her car waiting for me to run a quick errand on the way back I passed a little flower shop (a kiosk) I bought Alla a single red rose and carried it in my teeth. While walking from the kiosk to Alla's car I of course was seen by quite a few people and the looks that I got were very telling. The picture on the faces of the women faces portrayed many mixed emotions on the other hand the looks that I got from the men were very uniform, they all wanted to kill me. I can understand why, the reason that the feminine reaction would be along the lines of "If he can do that for his woman Why can my man not do that for me?" and the masculine reaction would have been along the lines of "My woman is going to want the same and I do not want to have to do that"
Just once in your life.... admit you were wrong! Some things come to mind. The first is that someone needs to learn how to understand what they are reading. The second is a a small sentence that has in it the words. ",,, Pot ....... Kettle ... Black" and the missing words are "The ___ calling"
For your benefit I will explain. I did not insist that I was right, I did not even say that I was right all that I said was that I was told a different version. Now do I have to explain that the word "different" is very different from the words "wrong" and "right".